Excursiones y tours archivos | Lucerna. Guía de viajes y turismo. Lucerna. Guía de viajes y turismo. Inicio Archivo por categoría "Excursiones y tours"
Categoría: Gastronomía, vino y vida nocturna. Chocolate factory visit & create your own chocolate bar, with private tourguide. Spend a day with the typical Swiss asset: Chocolate. Travel with your private tourguide – just you and your guide outside Lucerne center to he chocolate factory “Aeschbacher”, where you get an insight view to the fine art of chocolate. Taste chocolate during the entire exhibition and finalize your day with creating your own chocolate bar. Duración: 3 to 4 hrs. Mount Rigi Panoramic Walking Tour. Discover( Apr. – Nov.) some of the most remarkable landscapes in Central Switzerland on this private full-day Mt Rigi Panoramic Walking Tour departing from Lucerne. Experience by foot and with three different transportations modes with Europe’s first cogwheel train up the steep mountainside to the summit of Switzerland’s most magnificent natural landmark, Rigi Kulm; an aerial cable car ride to soak up sweeping alpine vistas; an inspiring walking tour along the captivating panorama trail towards Rigi-Scheidegg with magnificent views of Lake Lucerne and a relaxing Train ride from Arth-Goldau back to Lucerne. We have created for you one of the best adventures at Mt Rigi. This unforgettable Alpine experience at Mount Rigi ‘Queen of the Swiss Mountains’ can be combined with a two hr. walking tour in Lucerne, the most beautiful from all Swiss cities! includes the Chapel Bridge, Lion Monument and Lucerne Castle. Categoría: Escapadas y excursiones de un día. Bern city tour with private tourguide – starts from Lucerne. 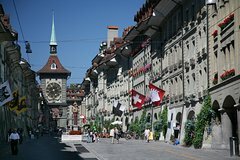 Spend a half day in Bern, the capital city of Switzerland with your private tour guide. Start with the train travel from Lucerne to Bern, then your walking tour will give you a complete overview of the spots of the city center. Your tourguide will show you the garden of roses with a fantastical view over the entire city, walk below the UNESCO-protected arcades, visit the bears closed to the Aare river and stand in front of the Swiss parliament building. The tour will lead you to historical buildings, storys and you will visit Albert Einstein’s house. Duración: 6 to 8 hours. Lucerne Morning City Walk with a Local Guide. Want to experience Lucerne like a local? Join me in a private walking tour as we visit world-famous sights such as the Chapel Bridge with the octagonal Water Tower, the Jesuit Church and the KKL Luzern (Culture and Convention Centre Lucerne). On the tour you will learn important and humorous facts about the history of Lucerne and the everyday life of its residents. You will discover hidden alleys, visit town squares and even catch a glimpse of the city’s “crown, ” the Musegg Wall. We will end the tour with a visit to the Lion Monument. We will also visit Lucerne castle. This is a Private Tour up to 6 persons. Excursión al monte Pilatus desde Lucerna con guía privado. Pase un día en Lucerna y en el monte Pilatus con su guía turístico privado, solo usted y su guía. Disfrute de una hora de travesía en barco desde Lucerna hasta Alpnachstad y cambie al tren cremallera del monte Pilatus, que es el de mayor pendiente del mundo. Disfrute de unas fantásticas vistas de Lucerna, del lago y los picos de las montañas alpinas de los alrededores. Relájese en la terraza de la cumbre antes de comenzar el viaje de vuelta. Descienda en telecabina por el lado norte del monte Pilatus hacia Kriens y disfrute de un breve trayecto en autobús de vuelta a Lucerna. Jungfraujoch Top of Europe Day Photo Tour from Lucerne Interlaken or Grindelwald. Take a memorable journey to the impressive world of the Jungfraujoch – the Top of Europe, designated by UNESCO as a natural “World Heritage Site of the Swiss Alps”. Visiting the Jungfraujoch’s eternal ice and snow kingdom is a once-in-a-lifetime experience which offers plenty of photography opportunities. When you arrive on the Jungfraujoch you can visit the various attractions such as the Sphinx Terrace, Plateau, Ice Palace, and Alpine Sensation. I will photograph you and your private party along the tour so you will get back home with long lasting memories captured in images. Categoría: Tours y visitas turísticas. Private Guided Day Tour to Mount Rigi from Lucerne with Boat Ride and Cogwheel Train. Spend a day around Lucerne and on Mount Rigi with your private tour guide, just you and your guide! Enjoy a one-hour boat trip from Lucerne to Vitznau and then climb up to Mount Rigi on cogwheel railway. Enjoy fantastic views over Lucerne, the lake and the surrounding Alpine mountain peaks. Relax on the summit terrace before beginning your return journey. Descend by cogwheel railway on the east side down to Arth-Goldau and take a short train ride back to Lucerne. Mt Stanserhorn Day Photo Tour Worlds First Convertible Style Cable Car. On this full-day Small Group Photography Tour you will discover the magnificent Mount Stanserhorn in the heart of the stunning Swiss countryside. 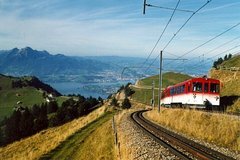 This journey to the (6230ft / 1900m) high summit involves different transportation methods, first take the train to Stans on the southern side of Lake Lucerne, a ride which will take roughly 20 minutes, then make a time-jump ride on a wooden vintage funicular from the 19th century right before getting to the top-modern Cabrio cable car. Great for Landscape photography! Discover the beauty of Lucerne city on an optional 2.5 hrs. photo walk and photograph and know the history of Chapel Bridge, Lion Monument, City old Wall and Lucerne Castle. All Camera skills welcome, from a compact, professional camera to an smart phone. 4-hour Lucerne City Tour with Private Guide Including Boat Trip on Lake Lucerne. Spend a half-day in Lucerne with your private tour guide, just you and your guide! Together with your tour guide you will discover the old town of Luzern, the wooden “Chapel bridge”, the lion monument and the magnificant churches in the city. Your tourguide will tell you stories about the city and the life in Luzern. Close your tour by travelling with your tourguide on the scenic boat on lake Luzern and enjoy the view to the lake, the city and the surrounding mountains.